R-group decomposition is a special kind of substructure search that aims at finding a predefined central structure - scaffold - and identify its ligands at certain attachment positions. 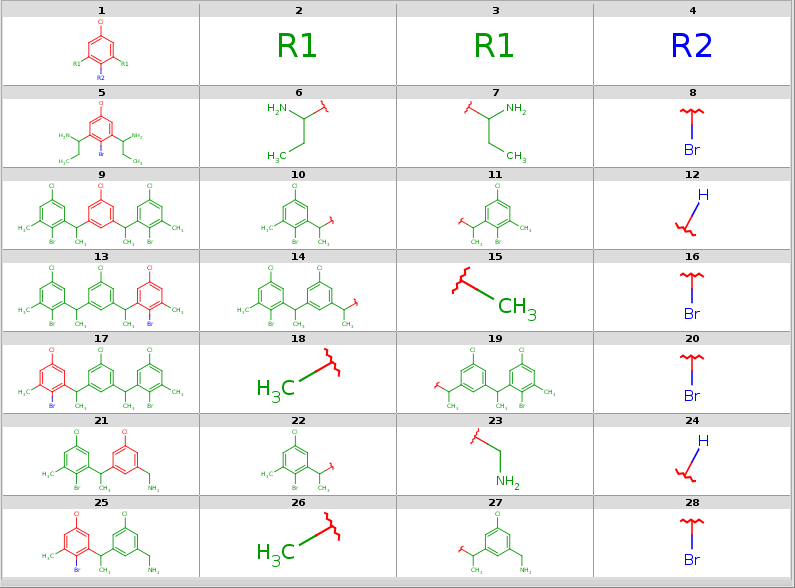 The query molecule consists of the scaffold and ligand attachment points represented by R-groups. 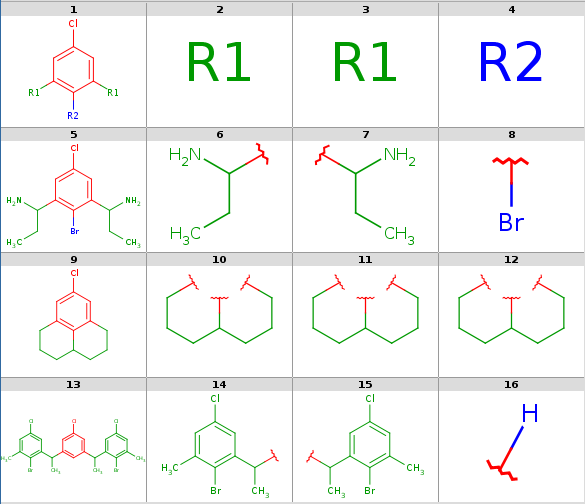 These R-groups are simple R-group atoms without R-group definitions. 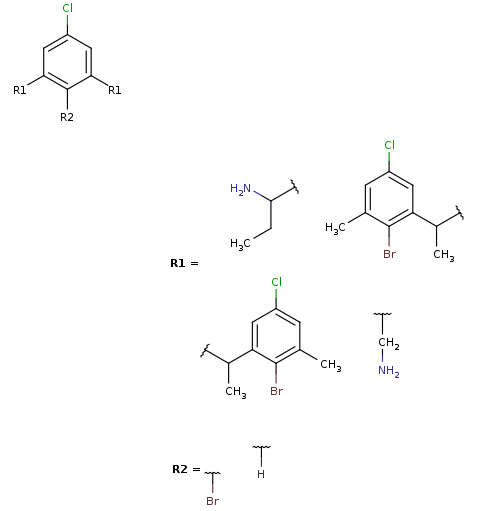 R-group Decomposition is available from JChem for Office, Instant JChem CT, API (RGroupDecomposition and MarkushGenerator), command line and KNIME. RGroupDecomposition includes methods to set the query and the target MolSearch. Each decomposition corresponds to a group hit, see findFirstGroup() and findNextGroup() . The search hit has to cover full fragments, that is, extra ligands are not corresponding to some query R-atom are not allowed. 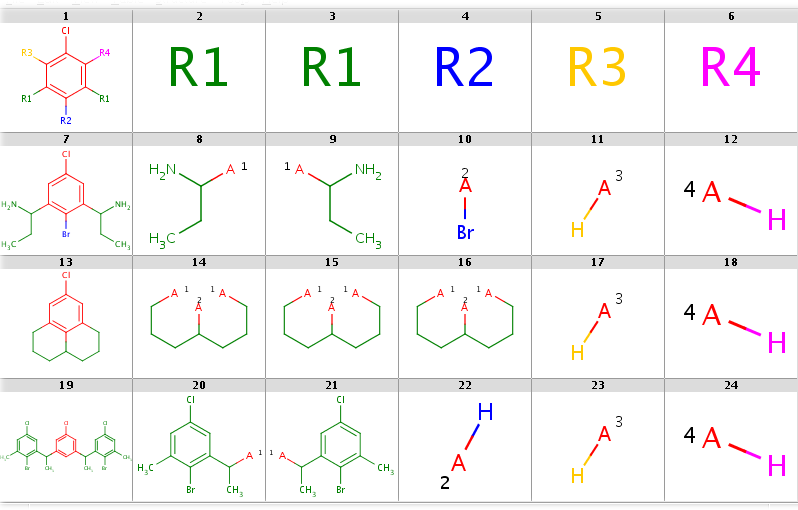 If the query does not contain R-atoms then it is automatically modified: all implicit hydrogens are replaced by different R-atoms attached by any-bonds. Decompositions are returned in a dedicated Decomposition result object, see findFirstDecomposition() and findNextDecomposition() . Output in table form is returned in findLigandTable() . 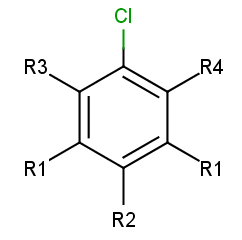 It is also possible to generate a Markush structure in the form of a RgMolecule which covers a list of specified targets. The root structure is the specified scaffold (query) and R-group definitions are determined by the decompositions of the targets. This functionality is implemented in MarkushGenerator. script or batch file as described in Preparing and Running Batch Files and Shell Scripts. Search options are identical to that of jcsearch . In this section we describe the R-group decomposition specific command line options. Default when query originally contains R-atoms. R-atoms added automatically in place of implicit H-s.
-q, --query <query>                  Query SMARTS string or file. Set -S '' to skip standardization. -g, --ignore-error                   Continue with next molecule on error. Query and target standardization can be specified in the --standardize option: the standardization configuration is given either directly in a simple action string or as a configuration XML file path. 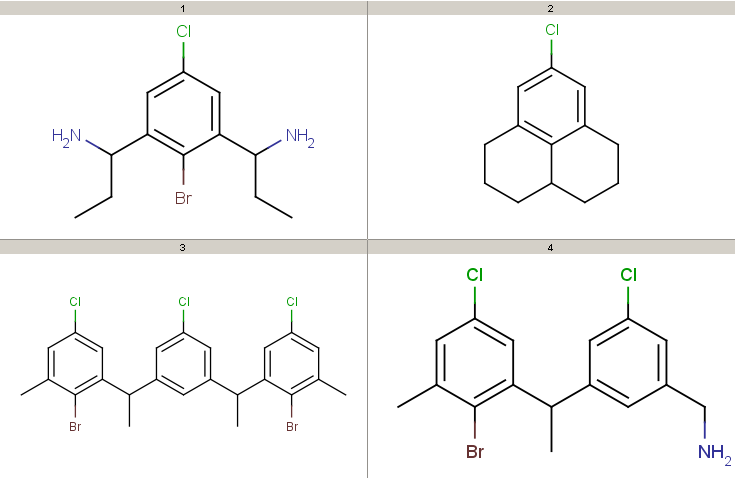 Note, that substructure search requires aromatized molecules, therefore -S 'aromatize' is the default. You can skip standardization by setting -S ''. If the query has no R-group nodes then the Ra modification is applied automatically. Note, that the default any-atom representation and atom maps can be exported in all molecule file formats, while R-group attachment is not available in SMILES and atom labels are only supported in MRV. In the case when the query contains R-group nodes with the same R-group IDs (e.g. two R1 atoms), these nodes represent identical ligand structures by default. If we set the --RLigandEqualityCheck:n option then we allow different structures to match these nodes. In this case, the identical R-group IDs only represent symmetrical attachment positions on the scaffold but have no implication for the matching target structures. We call bridging R-atom matching when two R-atoms match the same group of target atoms. By default, bridging R-atom matching is not allowed, it can be enabled by setting the --bridgingRAllowed:y option. The R-atom matching behavior can be set in option --undefinedRAtom. By default, R-atoms can match heavy atom groups or hydrogens ("gh"), but empty set matching is also allowed ("ghe") for R-atoms that are added automatically if the original query did not contain R-atoms. The usefulness of this is shown in an example of empty R-atom match under the Examples section below. The R-atom matching behavior can be further specified in the option --hitOrdering. By default, the order of the returned hits is arbitrary in the case when there are multiple hits. However, by setting --hitOrdering:g heavy group matches will be preferred in the order of R-group numbers. For example, if there are R1, R2 and R3 R-groups then the sorting algorithm will try to match R1 to a heavy group if possible, otherwise a H-atom and finally to the empty set; then the same is played with R2 and then with R3. In the case when R1 and R2 are in symmetrical positions and one of them matches a heavy group while the other one matches a H-atom, it is guaranteed that it will be the R1 which matches the heavy group in the first place. The unsorted and the sorted matchings can be compared in the example of empty R-atom match under the Examples section below. Target and ligand alignment to the query can be disabled by setting the --keep-coordinates parameter (meaningful for 2D output formats). This can be useful when the target is already aligned and when the query is symmetrical. In these cases the alignment can give unexpected results. If the --Markush parameter is specified then the decompositions are transformed to R-group definitions and added to the query. Those targets which match the query structure will be contained in the enumerations of the resulting Markush structure. For an example, see Markush generation example above. Only one decomposition for each target - corresponding to the first search group hit - is presented in the output by default. If the rgdecomp command line option --allHits is specified, then all possible decompositions are listed. If the command line parameter --ignore-error is specified, then import/export errors will not stop the processing but the error is written to the console and the molecule is skipped. By default, the program exits in case of molecule import/export errors. A list of API usage examples can be found in the RGroupDecomposition and MarkushGenerator class headers. In the case of database search, the hits can also be retrieved as R-group decomposition result objects. 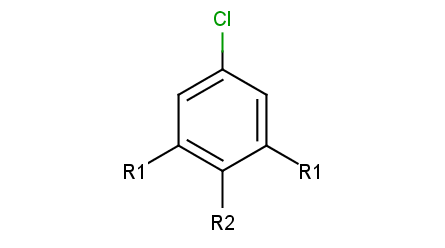 Refer to the JChemSearch guide for details. It is more efficient to apply database search in case of many targets since JChemSearch uses parallel processing while RGroupDecomposition is run on a single thread. 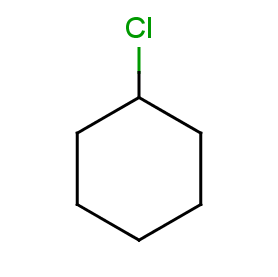 Note, that there are two R1 atoms referring to symmetrical ligand positions. By default, this means that the matching ligands should be identical. You can change this behavior by setting the --RLigandEqualityCheck:n parameter, in which case the same RGroup ID is only used to denote symmetrical positions on the scaffold and different ligands at these positions are also accepted. Ligand attachments are not allowed at implicit H atoms, that is, each decomposition corresponds to a full fragment match. R-atoms with any-bond attachments are automatically added if the query does not contain R-atoms at all. Decompositions using the different query options (no modification, add R-groups) are shown below. By default, decomposition is generated for the first hit only. To process all hits, set the --allHits option. Standardization may be necessary, only the aromatization task is preformed by default. Substructure search requires aromatized query and target structures and also assumes that the same functional group representation is used in the query and the target molecules (e.g. nitro-groups, also think of tautomer and mesomer forms). Standardization can be specified in the --standardize option. and coloring data is stored in the molecule property "DMAP" if the output format is SDF. To get a nice table output, we specify the number of MView table columns in the --c parameter of MView. Alternative decomposition output styles for the above query and targets are shown later. To run these examples, refer to the preparation instructions. Note, that if SDF output format is chosen then we keep the default any-atom attachment point markers, since only at most 2 R-group attachments can be saved in SDF format. Note, that we have to set aromatization since our molecules are in dearomatized form (SDF). To store the results in dearomatized form, we have to specify dearomatization in the output format: -f sdf:-a. By default, attachment points are denoted by newly added any-atoms, since this can be stored in any output format. We have chosen R-group attachment representation instead by setting -a P. We use the -k option to use the original coordinates, since our structures are already aligned. Alignment with symmetrical queries may have unexpected results. The Java Virtual Machine version 1.6 or higher and JChem have to be installed on your system. A command shell (under UNIX / Linux: your favorite shell, under Windows: a Cygwin shell or a Command Prompt) has to be run in the RGroupDecomposition_files subdirectory. You can type these examples and see the results yourself in the subdirectory RGroupDecomposition_files where you can find the input files query.mol and targets.sdf. Note, that we use the -k option to disable alignment, which can give strange results in the case of symmetrical queries (try this by running this example without the -k option).